​It was the AGM last night. The numbers were slightly down on previous years but it was a very interesting evening followed by an excellent spread of food provided by the new Pub. You will see there is no Club Historian listed in the committee this year. Adrian Leach has, due to commitments at home explained how he cannot devote the time needed to the committee, but he is willing to continue to act as Historian in a non-committee position. 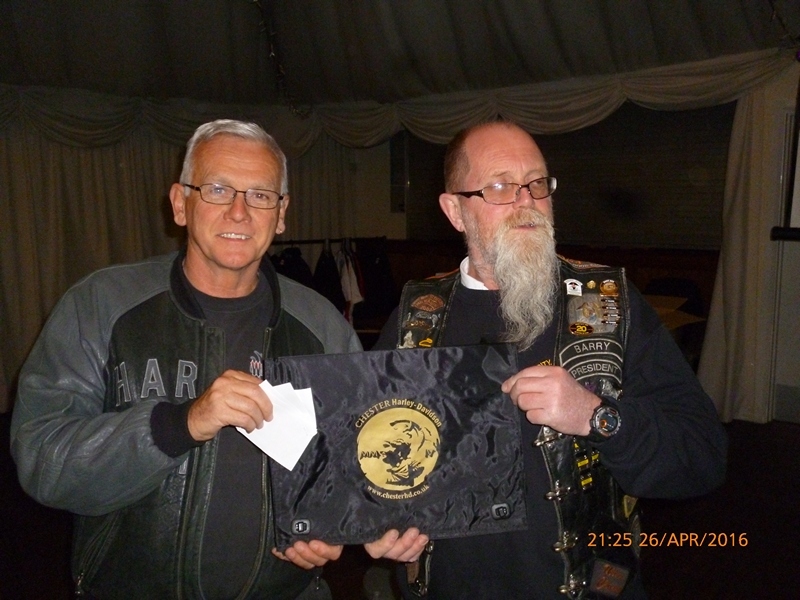 His offer was gratefully accepted and Barry thanked him for his efforts on the committee over the past years. 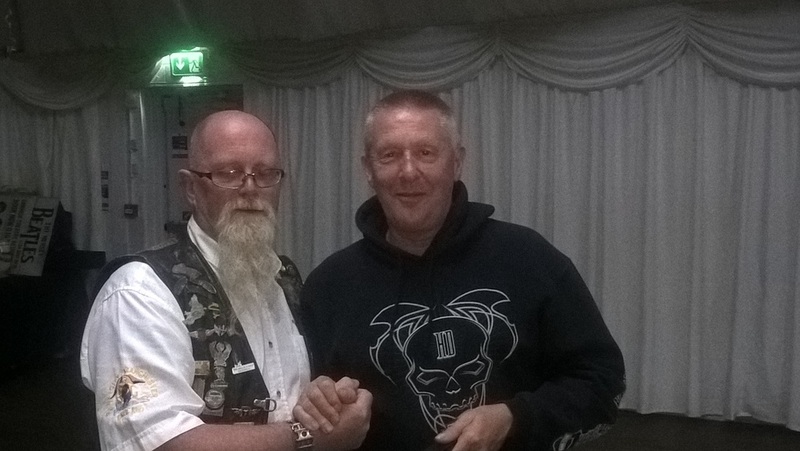 Our Club member of the year, as voted by you, was Ken Vickery, a very deserving recipient, who puts an enormous amount of effort into creating anything we need for Events, bike shows and rallies. Thanks for all the hard work Ken. 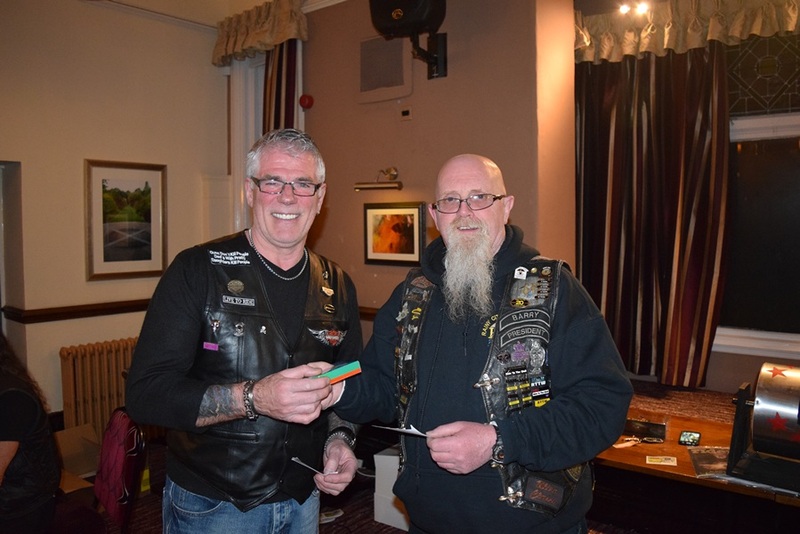 The members draw was won by Bill Malley. Well we’ve had another busy year, with the Kulture Kruize and Weser-Ems being the big Road Trip Highlights. 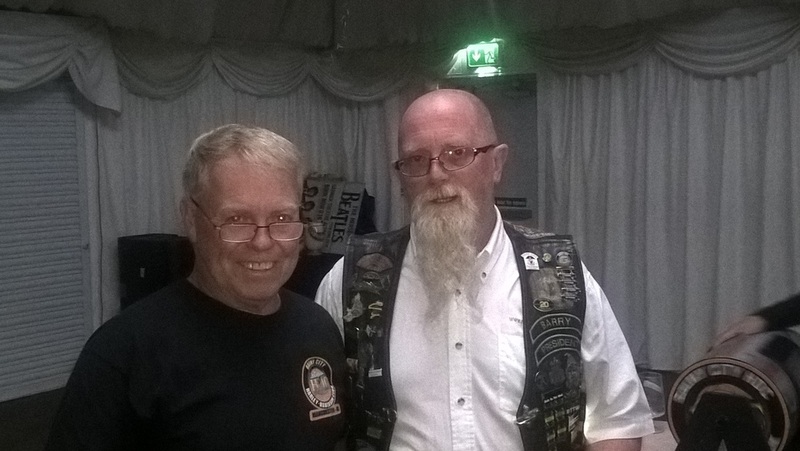 We’ve also attended rallies and events all over the UK, from Stirling in the North to The South coast and Wales. We certainly have got around. 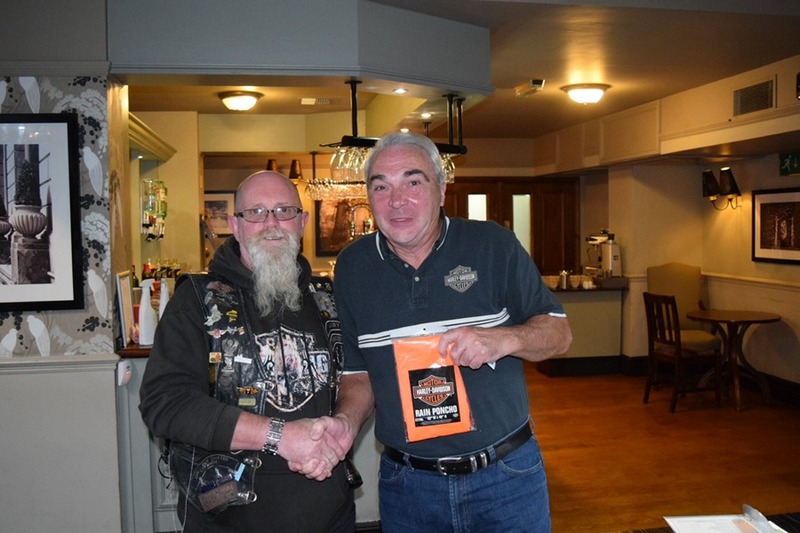 Our numbers have dropped slightly over the previous year, and, in an effort to recruit new members we are have now started a new promotion campaign on Facebook, (Rainy City Harley Davidson Club) and Twitter (@rainycityhdc). We are also producing Club Introduction Cards, for members to pass out. Please have a can you have a look at the Facebook and Twitter accounts and like and follow them. You can also share the details to your friends. We will be using these to promote events, meetings and rides alongside our current methods,(Flyers, Newsletter, Website, Text and email) Remember this is your club, and the more you put in, the more you get out. September was one of the quietest months for news that we've had in a while. 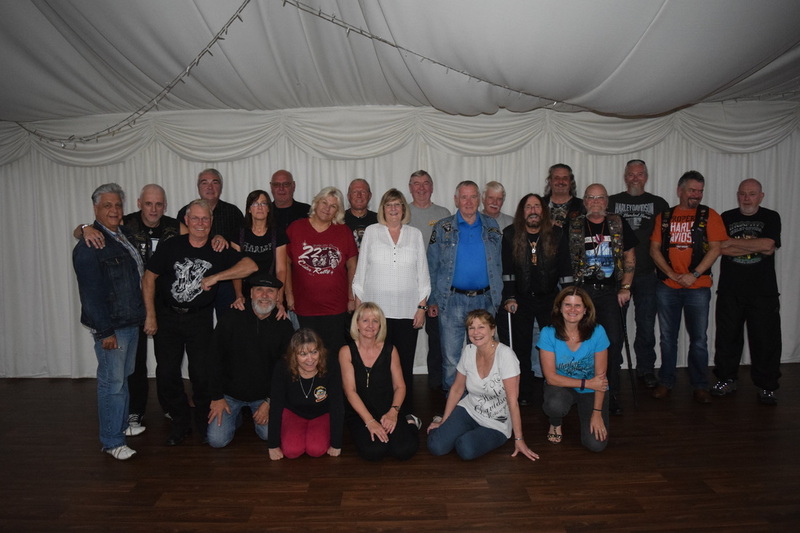 However the new venue made up for it, yep the was the first night at our new base The Woodthorpe Hotel. So what did you think about it? a great choice of beers a wide selection of food and we have the room to our selves without waiting for others to vacate. ​We had two visitors that found us at the Manchester bike show so welcome to Racheal & Michelle - lets hope they like us enough to join. As I mentioned not a lot of news most of which has probably happened by now. The RTTW is not leaving Knutsford services until 10am on Saturday, marshals can you please be there by 8:45 am at the latest. There are more bikes booked in this year than last - and it was busy last year and we need to get them parked up. 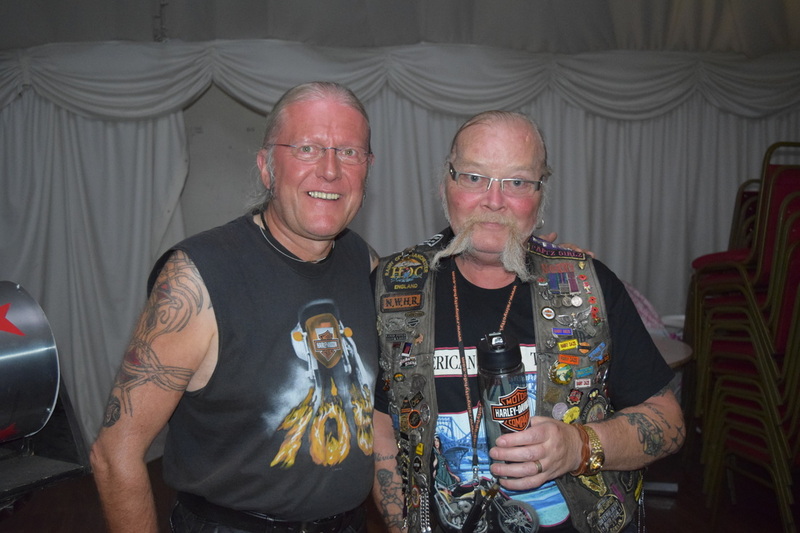 Up and coming rallies are the Staffs Classic & mechanics show, Southport Cruisers Halloween Party which is usually good fun we've done it as a club a couple of years a couple of years ago and then there is the NEC Bike show towards the end of November. As you may know we don't have a meeting in December but we do have a get together at the HardRock in the Printworks Manchester. This year is on Thursday 29th December and as usual a few of us will be getting there earlier for a few beers before the meal in Chiquitto's. For all the above either check the events page or wait for the flyers to come winging their way to you via the interweb email. Next meeting is the AGM so get your voting forms in and if you want to be on the committee fill the form in - if you don't then you can't bring it on the night and expect it to be included, so what are you waiting for...? Here are the raffie winners. Wow Lady Margaret winning a prize and in front of a camera..! Gill won the fourth prize. 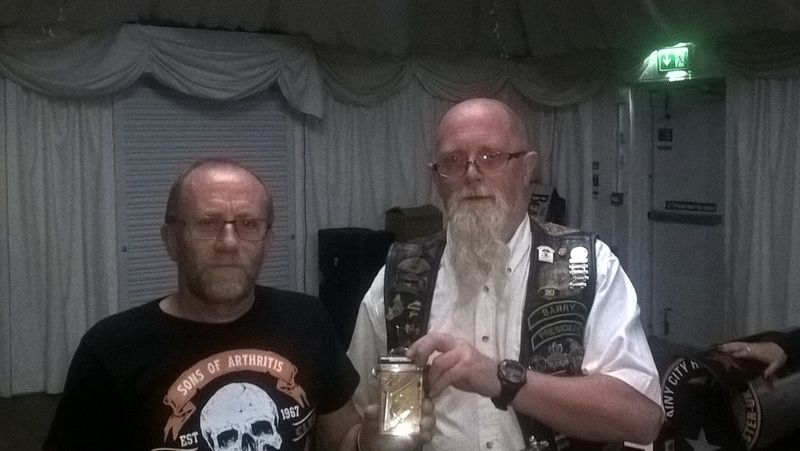 And the quiz winners - Tony Andy Bill & Brian. Here's Tony collecting the beer. Don't forget its the AGM so be there. Well guess what Helen & I were on holiday travelling route 66 for the second time, though on this occasion we were with our good friends Dave & Lizzie Kennedy. We had a great time and can recommend it to anyone. 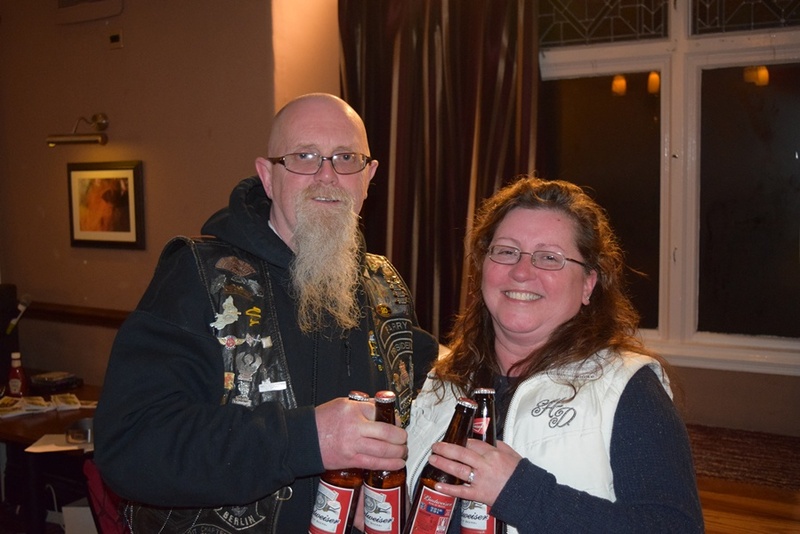 So... we weren't at club night so I have no idea what went one, however our club photographer was good enough to take some pix of the night - the last one at Bowdon rugby club. A big thank you to the rugby club for allowing us to use the function room for the last few months until we found a new home. As usual we will start at the meeting at 8pm so arrive early if you want to eat. 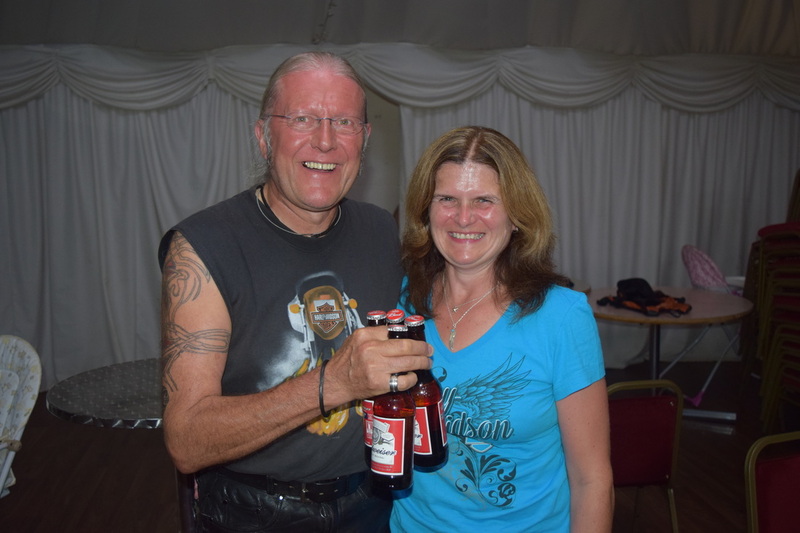 Here are the pictures from August club night. The last but one meeting before we vacate Bowdon rugby club's function room that the Rugby Club have kindly let us use since our departure from the Moorfield. From September we will be at the Woodthorpe Hotel in Prestwich. Not a lot to report this month Bill Malley made a request for any tools i.e. spanners preferably Whitworth that you may just have laying around looking for a new home that you would like to donate to a good cause that of restoring old locomotive engines, get in touch if you have any. As Rainy Daze was last weekend Jon gave a brief report obviously he couldn't tell us anything in detail as it was too soon after. Briefly the rally was 12% down on numbers RD12 had 120 people enjoying themselves this year it was only 106...! Setup on Thursday and breakdown on Sunday worked very well I think it was one of the most organised and speediest yet so thank you to everyone that gave up time on Thursday and Sunday we couldn't have done it without you. 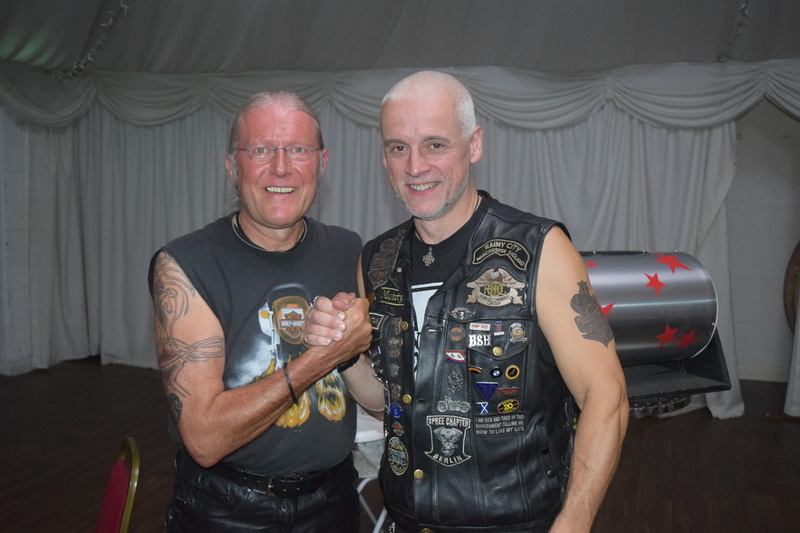 Kev updated everyone on the forth coming events and also informed us that Dave Mason was selling his trailer, He tows it behind his glide and is in excellent condition. You will have had a flyer by now so if you're interested give Dave a call I'm sure it won't last long. Mal needs the Xmas party booking forms in ASAP, her contact at the hotel has been made redundant so all booking have to be made through a central office. So if you miss the deadline you may not get a room. Here's Marion collecting the monthly booze. And the raffle winners are. Next Club night is August 30th. 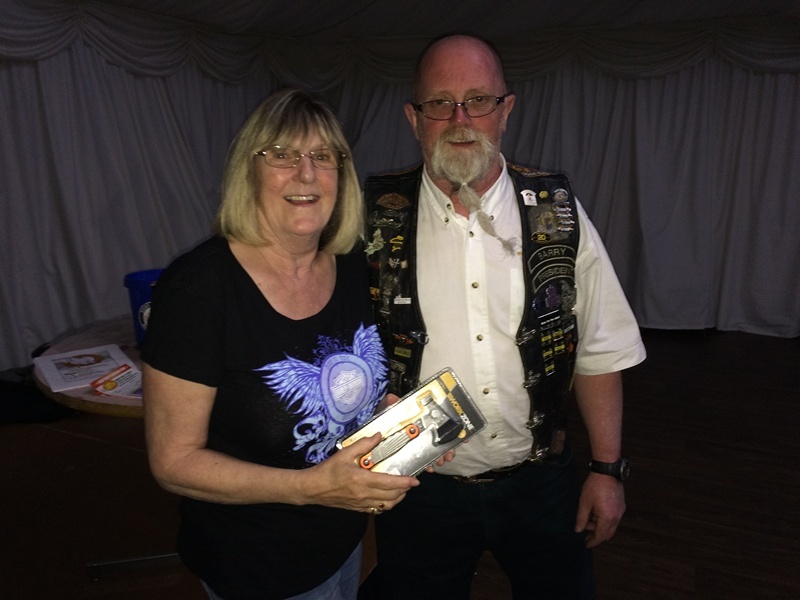 Hi all sorry for the late update, Helen & I were in Barcelona for Barcelona Harley Days so I got behind. Well what was it like - we don't know as it had been cancelled back in March, doh. There was no advertising, some websites saying it was still on and others saying not. As we'd booked flights and hotel in January we would have gone anyway. Its a beautiful city and we can recommend it. 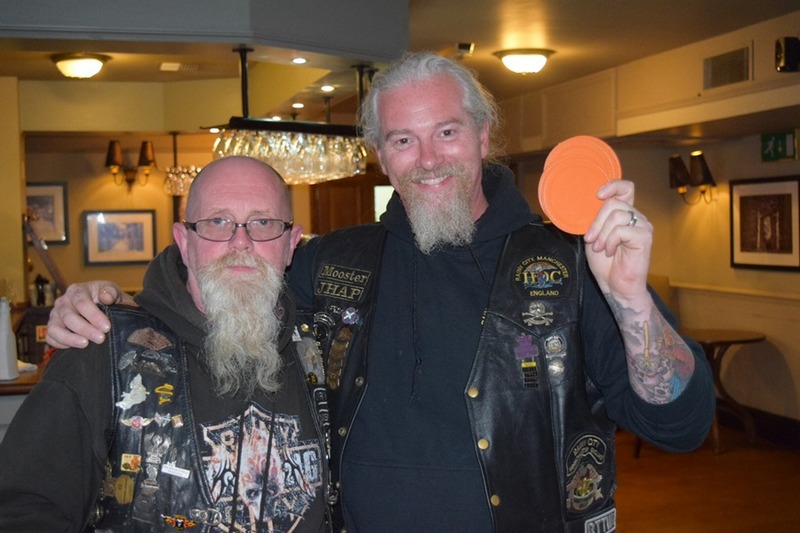 While we were at the dealer a group of French riders turned up doing the same as us, they'd been in previous years and booked early, on the Monday when we visited the dealer there must have been 10 bikes/riders from the Birmingham HOG Chapter there! we didn't get chance to speak to them so not sure if they were there for Harley days or just on holiday. 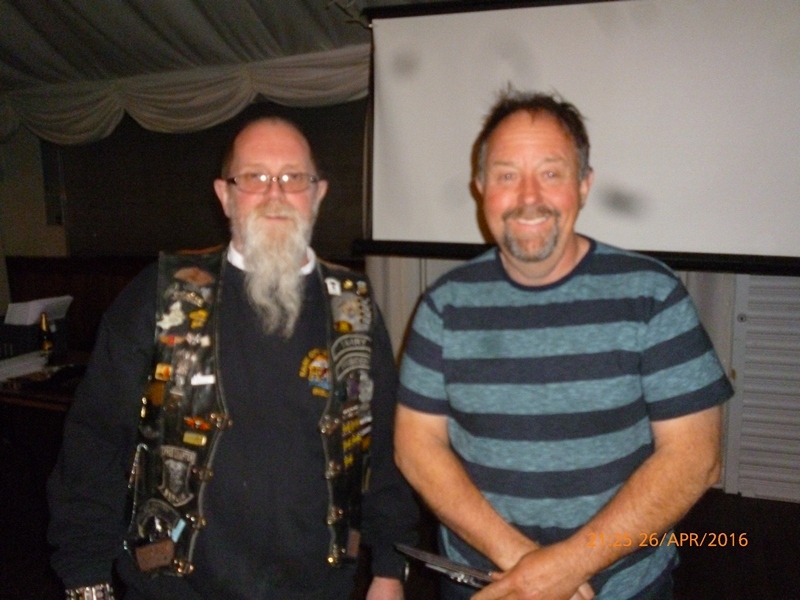 Anyway back to the June meeting, it was a very quiet night with a slow start and only about 25 members turning up so a decision was made not to have the raffle or quiz. Barry just updated us with new events and a few happenings. If anyone can suggest a pub that has easy access, serves food and has a free function room available that we could use as a club meeting point can they send any suggestions to any of the committee for us to investigate. You should all have had the latest edition of Hogwash by now and contained within will be a new ride out list. It was decided to re instate the list so anyone wanting to go on a ride would be able to plan their time around it rather than getting a message a few days before. The list isn't exhaustive and may be subject to change, so do keep an eye open for texts/email updates. 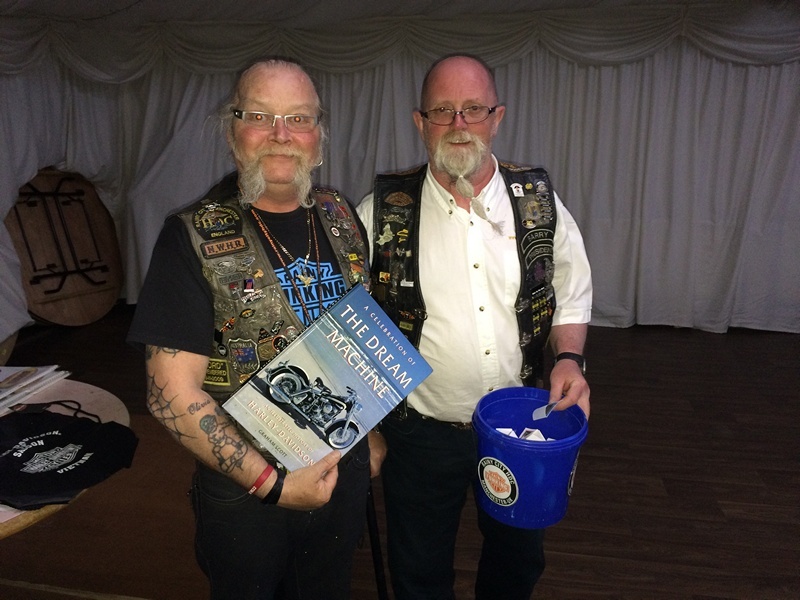 The Gentleman's ride this year will be starting and finishing at Dukes in Manchester and there will be a band on as well. The route will hopefully be more organised this year, with less disruption from the council. Rainy Daze is almost upon us so please this a last call for you to get your tickets, we also need volunteers for set up on the Thursday if you can help please be at the rugby club for 10am. We also need volunteers for the take down on Sunday - probably more important for us so we can get home at a sensible time as well. The Xmas party is the last Saturday of November, the flyers and bookings will be starting soon after Rainy Daze. Thats it for now see you at Rainy Daze. Next Club night is July 26th. Another night at our temporary home - Bowdon Rugby Club. Quite a few turned up on bikes this month; its amazing what the sun does. Andy Bond turned up on his new Indian Scout which looked very nice. It was generally a quiet night with the main focus being any new events being highlighted members will have had the flyers via email by now. Talking of events its a little over six weeks until Rainy Daze so if you haven't got your tickets then you've missed the deadline for the reduced price from now on its one price for all of £25. 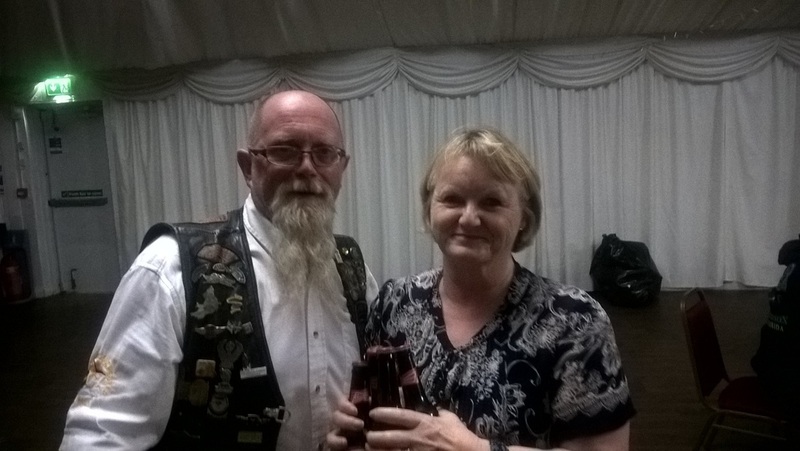 For those of you that know Ron & Ingrid from Holland - they always make it over for Rainy Daze, we've heard that Ingrid has been taken ill, so we wish her well. Now for brighter news, we had a birthday announcement. 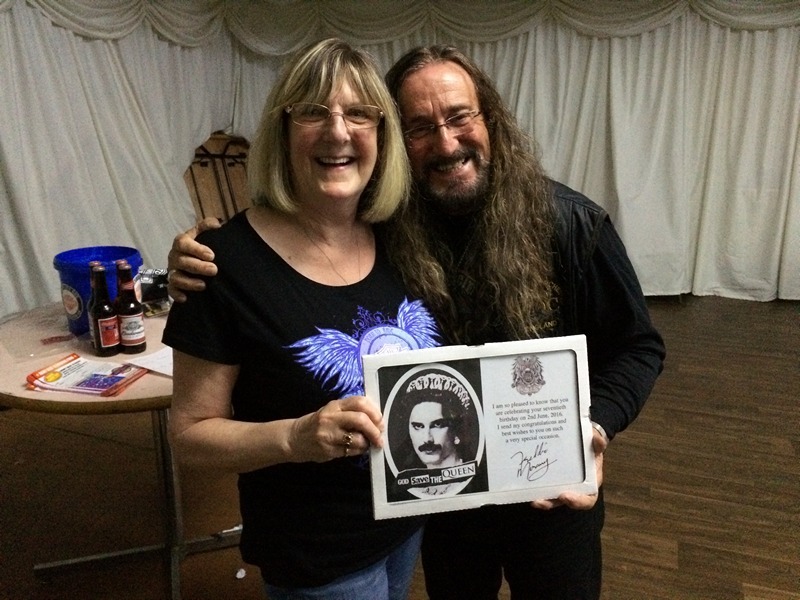 Carol Mason had a birthday and thanks to her husband Dave we all now know which one it was..! If you weren't there then it's a secret, I never reveal a ladies age. Dave had obviously spilled the beans to Kev as he'd had time to make a card, from the Queen, take a look below. Looks like Carol also wanted a birthday present with the first number. Bill's happy about that as he had the second number. Nobby won a book; don't worry Nobby it has picture's as well. Jon didn't want to be seen - last...! 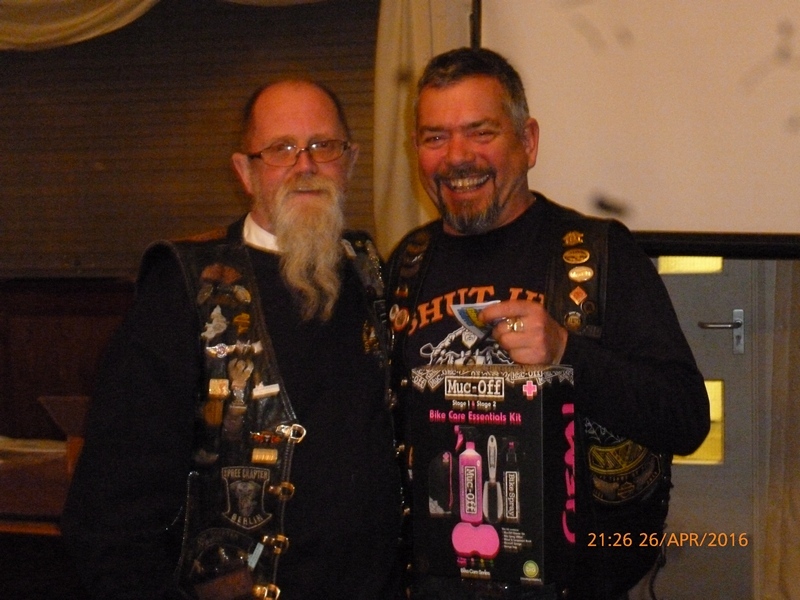 Andy and Dave are shy so Bill who likes getting prezzies collected the winners prize. Next Club night is June 28th. Hi all, well its seems that the messing about with the Moorfield with our club nights since Christmas was leading up to them not wanting us to hold our club nights there, we still don't know the actual reason - so no more club nights at the Moorfield so the search is on for another venue. 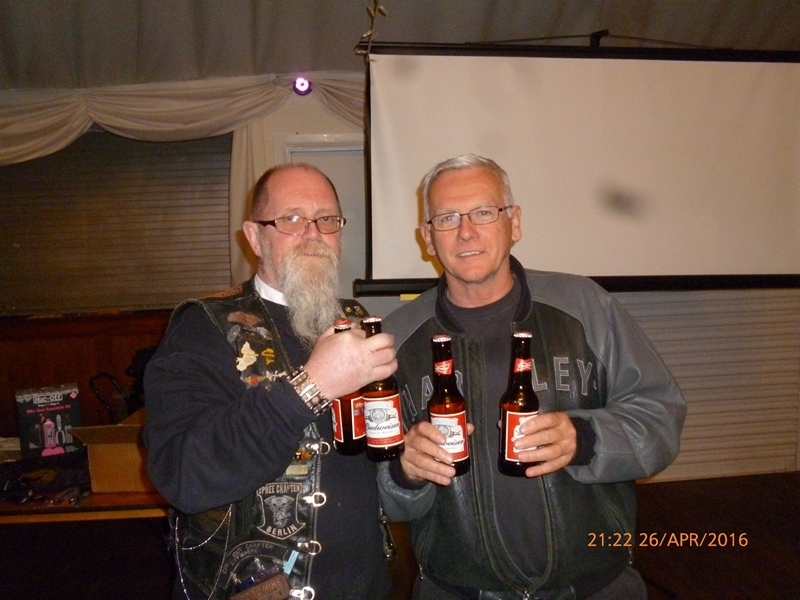 It was about 5pm on club night that we found out so yes it was short notice, thankfully the Bowdon Rugby club let us have the function room last minute. So for the next few meetings it will be at the Rugby club. Following on from the talk Kevin went through the forth coming events highlighting any new one's for which you will now have the flyers and your copy of Hogwash. 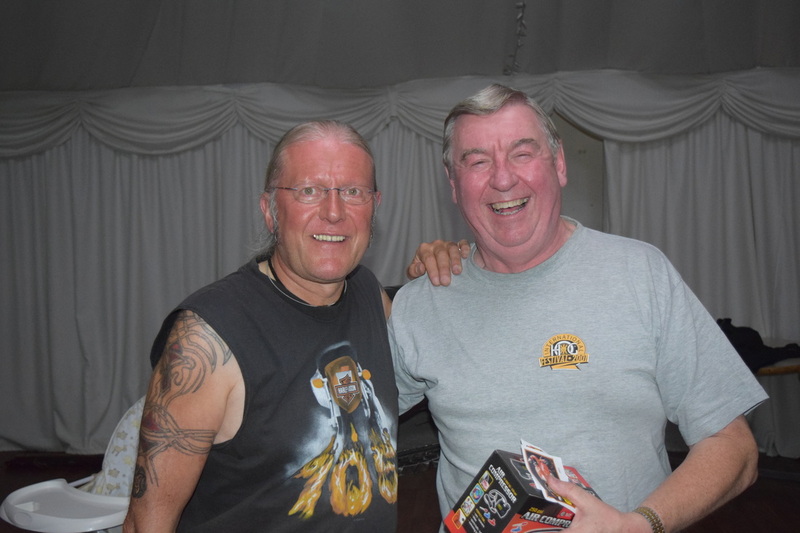 The quiz was won this month by Andy, Ade, Nobby & Brian. Here's Andy collecting the beer. And the raffle winners are...! Second prize of the night for Andy. Is this your first time Stuart? 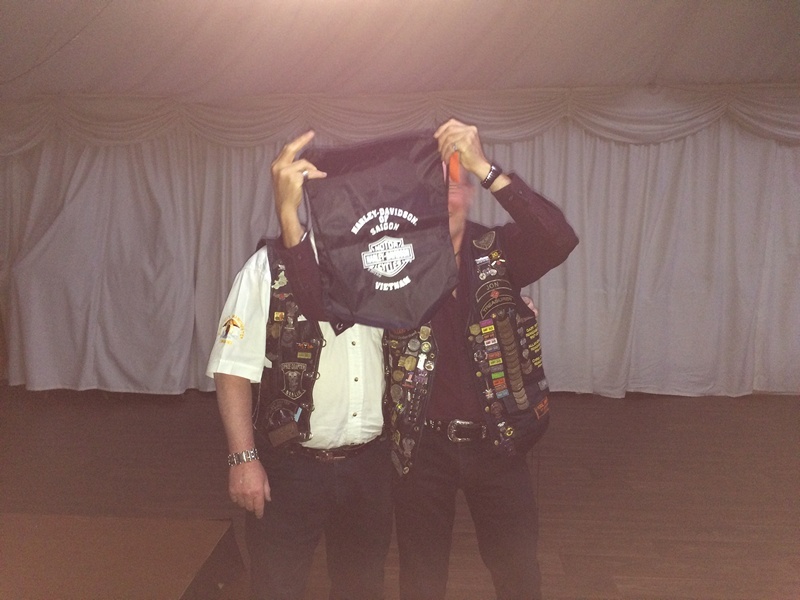 Not content with best Harley Nick wants a raffle prize as well. Next Club night is May 31st. !orry this update is a bit late but stuff and things got in the way a little. 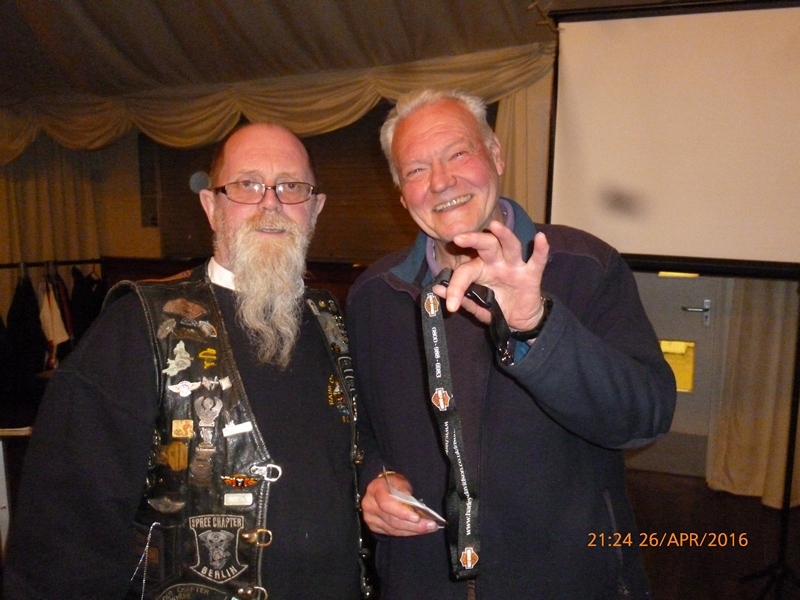 This meeting was back on track at the Moorfield we were back on the Tuesday and on time - well it was on Barry time. With being late most of the news won't be relevant any more - mainly to do with the Manchester Bike show. For those that didn't make it there are some pictures in the gallery. 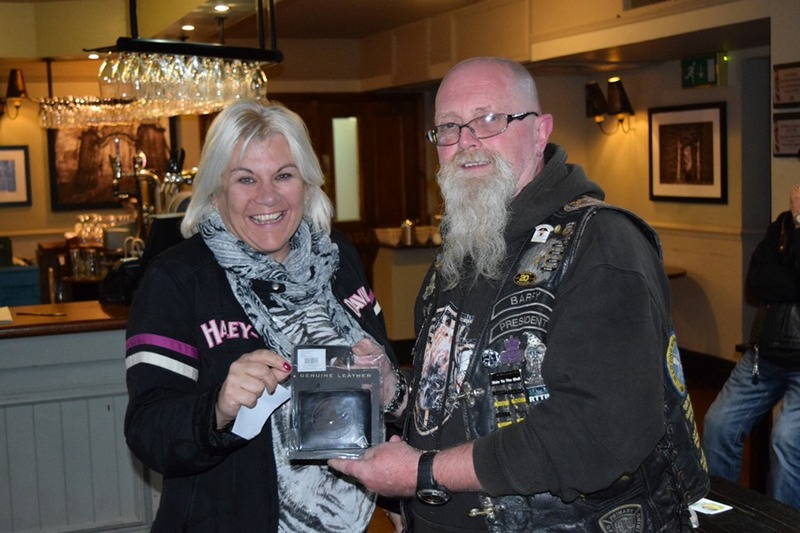 The good news is that Rainy City had two winners, Nick Jackson won best Harley and Barry won Runner up Best Harley - see what happens when your bike is clean Barry! Rainy Daze tickets are selling well but we still need you to get your tickets asap; one to take advantage of the reduced early booking rate and as we have started paying out for the rally the ticket money in the bank would help. We have one 2016 calendar left priced at £5 call Barry if you want it - first come first served. The quiz this moth was a turn up for the books, it was won by Helen & Margaret; I wouldn't have believed it if I hadn't been there and sat on their table - miracle's and all that stuff. 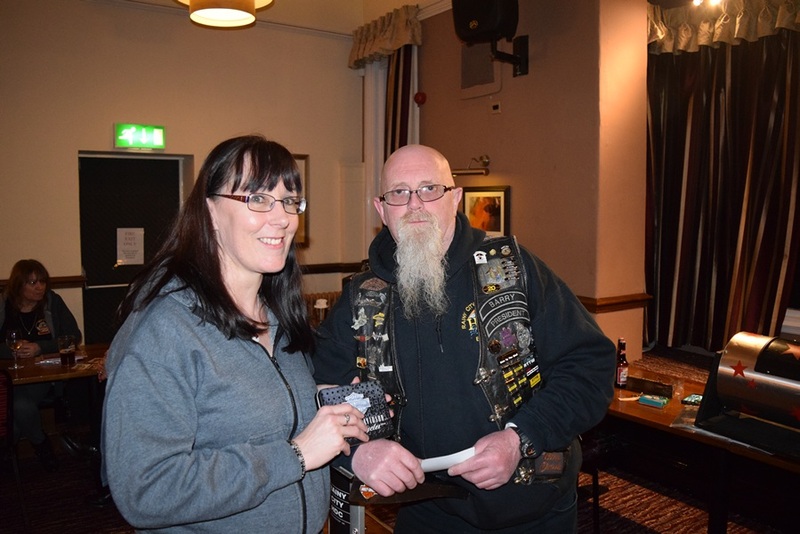 Here's Helen collecting the prize, unfortunately Margaret wouldn't pose for a pic - probably with being 'Lady Margaret' she must be fed up of having her picture taken. Alicia won the first raffle prize. 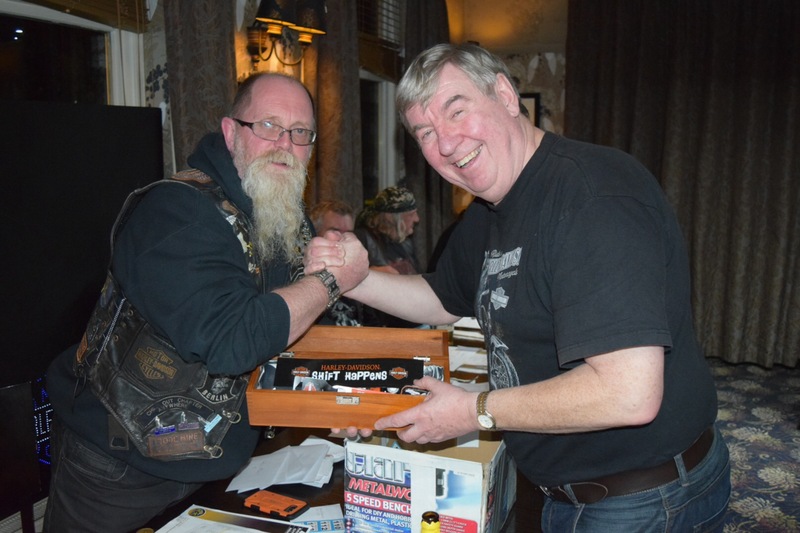 Here's Ian with the second prize. and finally Adrian the fourth. Next Club night is April 26th. 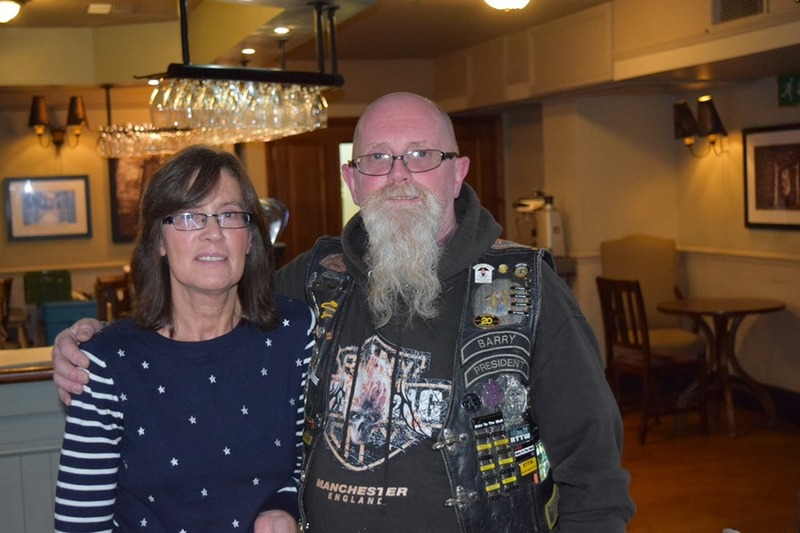 Another mix up kindly provided by the Moorfield this month, the dramatics group were in the room again on Tuesday so we took the decision to have club night on Wednesday this month - other than the day all was as per normal. 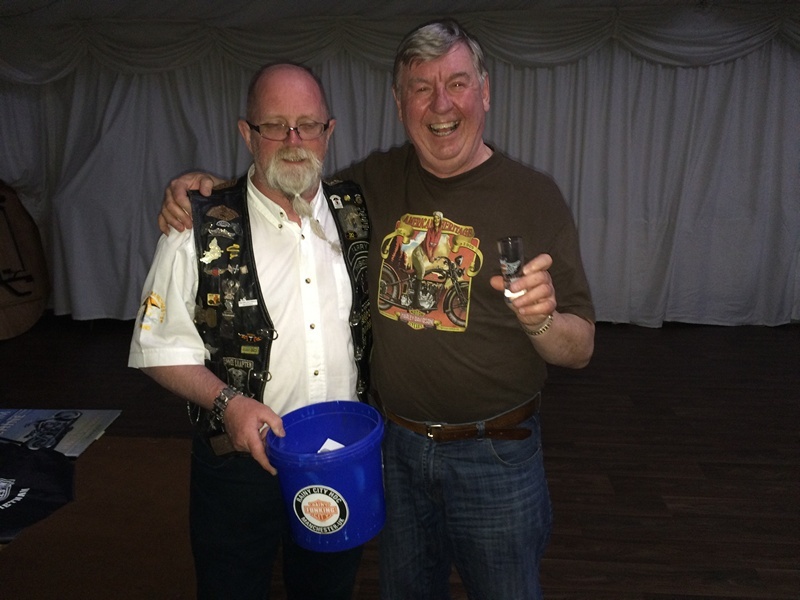 Hog wash was available for collection if you were there otherwise you should receive it in the post soon. The Rainy Daze Flyers/booking forms are also available along with tickets for the rally - don't forget if you pre book the tickets are £5 cheaper before the end of May. Jon read out a thank you letter from Children in Need to who we donated £250. So far we have one person volunteering to put their bike on the stand at the Manchester bike show - we need 12. The stand is twice the size it was last year as we were overcrowded, now we have twice the space we haven bikes...! come on let Jon know they you'll put your bike on the stand. It was also a celebration for Norman as he was 69 years young, here he is with a special birthday cake. We did however still have a raffle and here are the winners. Well first of all let me wish everyone a happy new year - lets hope its a good one. 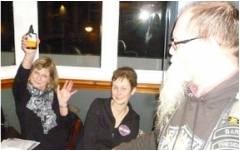 ​Unfortunaley due to a mix up at the Moorfield they had booked out the meeting room to the dramatics' club thingy group, hopefully it will be sorted out for February's meeting. First of all there are a couple of members with medical issue's Howard Thompson is in hospital we wish him a speedy recovery, Dave Mason our club photographer is having an op to sort out his 'icky leg he should be home now resting - see you back soon Dave. 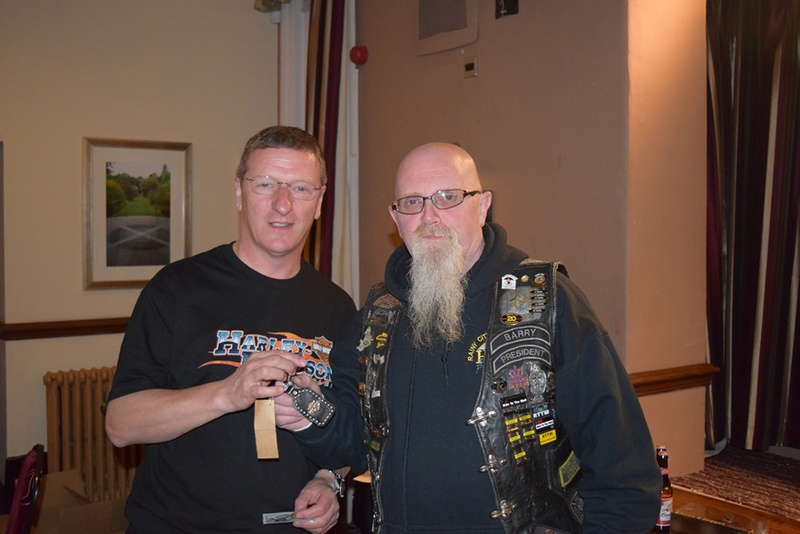 An unfortunate piece of news, Eric Foster who some of our members from the start up may remember, unfortunately passed away last week suffering a heart attack. Eric and his wife had moved to France some years ago. It's that time of year again where we need your support, at the weekend of the 2-3rd April it's the Manchester bike show and we need about 12 bikes for the stand. This year the area we have is about twice the size that it was last year so the bikes won't be on top of each other. If you'd like to have your bike included send an email to Jon giving him details of you bike etc. this year YOU must be able to get your bike to Event City on the Friday and take it home on the Sunday after the show closes at 5pm. Rainy Daze 13. Can you believe where the previous 12 years have gone..! time goes so fast. Please note its the 4th weekend of July that's 22nd - 24th July make a note in your diary. As last year it will be cheaper for you to get your ticket early - watch this space for when tickets are available. Also keep an eye on the events and calendar pages as events start being announced they will be updated. If you're going on the Germany trip this year can you please make sure that you get your deposit of £25/person to Barry asap. If you'd still like to go there are a few places left - again let Barry know asap. All the vans are booked for the Kulture Kruize which is gong to Dawlish Sands this year. Back in 2015 you were asked to vote on a design for the new tour T Shirt by now you'll have had the flyer - if not check out the Shop page and get one ordered. There is a minimum order qty so if you hang on to long then they may not be enough or may not get printed at all. Don't delay. This month after a 4 year wait I finally got a webmaster patch not too long a wait...! Brian picking up the prize. and Monty - is that a man bag?